Your crush grip is the power between your fingers and your palm. Pinch grip is the power between your fingers and your thumbs. Cannonball grips are a great way to focus on both with one tool. 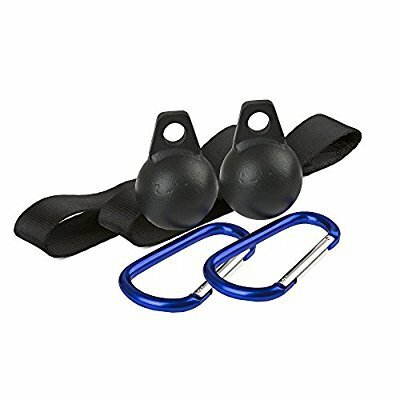 Strengthen your hands, wrists, and forearms with this set of CFF Fit Pit Bull Cannon Ball Grips. Strengthening your crush grip and pinch grip is great for rock climbing, weightlifting, and more. These are important assets for American Ninjas, Strongmen, and Power Lifters. Even if you're not competitive or performing in events, you can still be just as strong as those guys with these cannonball grips. If you're looking for a tool in your gym that can achieve different workouts all in one, you need this grip set. You can hang from them, do pull ups, or hand weight from them and take it for a walk. You get all kinds of possibilities with these grips, but they all lead to the same result of increasing your strength, ability, and endurance. These little balls hold a lot of weight. You can pull, hang, and swing from them. They're attached with a strong hardened steel carabiner so you don't have to worry about hitting the ground before you intended. Invest in the kinds of workout tools that will allow you to get continuous performance results and build your strength over time. Package contains (2) CFF Fit Pit Bull Cannon Ball Grips. Measure 3" in diameter. Attaches with a hardened steel carabiner. Black. Please note: Pit Bull Pinch Grips were designed to work with a loading pin, not hanging off a pull up bar or rig. CRUSH AND PINCH GRIP - Your crush grip is the power between your fingers and your palm. Pinch grip is the power between your fingers and your thumbs. Cannonball grips are a great way to focus on both with one tool. Strengthen your hands, wrists, and forearms with this set of CFF Fit Pit Bull Cannon Ball Grips. EXPAND YOUR ABILITIES - Strengthening your crush grip and pinch grip is great for rock climbing, weightlifting, and more. These are important assets for American Ninjas, Strongmen, and Power Lifters. Even if you're not competitive or performing in events, you can still be just as strong as those guys with these cannonball grips.